Sponsored by the Shepherd University Foundation, the McMurran Scholars Association (MSA) promotes and honors scholarly inquiry and academic excellence among those students who have received Shepherd University’s most prestigious honor, the McMurran Scholars Award. The organization seeks to model applications of scholarly work both on campus and in the wider community, provide networking opportunities among its members, and mentor current Shepherd students. The McMurran Scholars Association welcomes all McMurran Scholars interested in donating their time and talent to the organization. In addition to mentoring, you may help by attending quarterly meetings, assisting in the planning of events, such as the annual McMurran Scholars Convocation, or simply making a charitable donation to support the annual McMurran Scholars Association Scholarship for deserving Shepherd students. The MSA board meets four times each year in August, September, January, and March. All McMurran Scholars are invited to participate in these quarterly meetings, which take place at 5 p.m. in McMurran Hall. For a full list of MSA events, please visit our calendar. 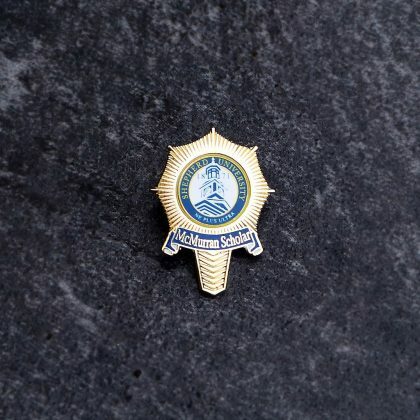 In recognition of the 50th anniversary of the first McMurran Scholars Convocation, Shepherd University, the McMurran Scholars Association, and the Shepherd University Foundation created the McMurran Scholar pin. MSA representatives initiated the annual tradition of presenting the pin to newly inducted scholars at the 2011 convocation, where the first pins were presented to members of the 50th McMurran Scholars class. All McMurran Scholars may receive a pin, courtesy of the Shepherd University Foundation. A resource directory compiled by the organization allows Shepherd faculty to utilize scholars in the classroom and for other student mentoring activities currently in development. All McMurran Scholars interested in such opportunities are asked to complete an information form. The McMurran Scholars Association Scholarship is funded through private donations made through the Shepherd University Foundation. The award was established in 2011 by the McMurran Scholars Association as part of the celebration of the 50th class of McMurran Scholars. Thanks to philanthropic support, the McMurran Scholars Association has awarded $1,000 annually to a McMurran Scholar pursuing graduate work at Shepherd University. In celebration of the 55th anniversary of the McMurran Scholars Award, a challenge was issued by the Association’s leadership to endow the MSA Scholarship Fund. In fall 0f 2017, the scholarship was fully endowed at $25,000.